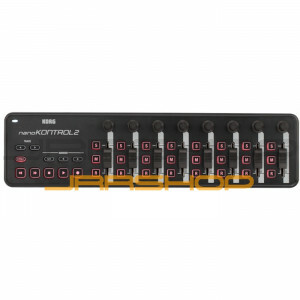 The Korg nanoSERIES provide a keyboard controller, a pad controller, and a studio controller with dedicated transport controls. Each of these USB-powered, slim-line controllers is designed to make the most of your valuable studio space, and is small enough to take with you on any musical journey. Place one of our keyboard controllers in front of your laptop, rest a pad controller on your music workstation, park a studio controller on your recording console - or anywhere else you need versatile control over your DAW, virtual instrument, effect or DJ software. Although small in size, all three nanoSERIES controllers go HUGE when it comes to functionality, yet their intuitive layouts provide extremely easy operation for any user. So c'mon; meet the nanoSERIES! The first on our list is the nanoKEY, keyboard controller, featuring a great-feeling 25-key velocity-sensitive keyboard that's ideal for song production. Each key on this USB-MIDI controller can also be set to send MIDI control data, further expanding its power. Next up on our list is the nanoPAD, a pad controller featuring 12 highly responsive trigger pads, each one capable of sending up to eight notes - or eight MIDI control messages - simultaneously, in addition to an X-Y touchpad with roll and flam functions for realistic drum programming. Last, but not least, the nanoKONTROL offers nine faders, nine knobs, 18 switches, plus a full transport section for expansive control; even a flexible note input mode to help you lay down your next big groove!